"Red-braised pork could well be the national dish of China. 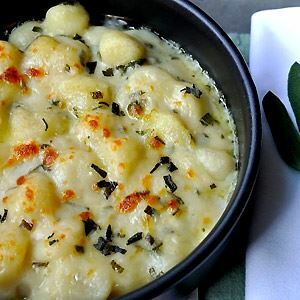 For a cuisine as diverse as China's, the provinces can't even agree on a staple grain – to generalise, in the south it's rice; in the north, wheat, millet or barley – let alone a style of cooking. The one constant seems to be red-braised pork. 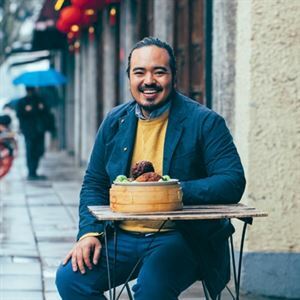 It exists in dozens of regional cuisines, and Chairman Mao loved the dish so much that in his birthplace of Hunan province it even took his name." 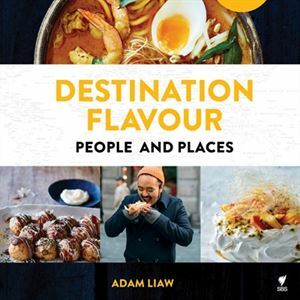 - Adam Liaw. Place the pork in a large saucepan and cover with water. Place over high heat and bring to the boil. Allow to boil for 15 minutes, then remove the pork and discard the water. Rinse the pan and set aside. Wash the pork under running water to remove any scum, then cut into 5 cm blocks; the pork will not be cooked through. Place the rinsed pan back over medium heat and add the oil and half the sugar. Fry the sugar until it becomes a dark caramel, then add the pork and stir to coat. Add the shaoxing wine, salt, ginger, star anise, chillies, cassia and enough cold water to just cover the pork. Bring to a simmer, cover with a cartouche of baking paper and simmer for 30 minutes. Remove the cartouche. 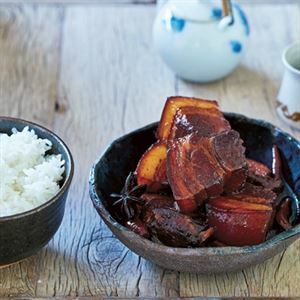 Stir in the soy sauce, then simmer, uncovered, for a further 15–20 minutes, or until the pork is tender and the liquid slightly reduced and glossy. Taste the liquid and adjust any seasoning if necessary. Allow to stand for 15 minutes and reheat if needed before serving.